Red squirrels like this one are active year-round, especially during the two hours after dawn and before sunset. They make their home in stands of pine, spruce, or hemlock. Watch for them in such areas at the Headwaters Conservation Area, Bowman Conservation Area, Walkup and Robinson Reservation, Westboro Wildlife Management Area (especially near the Fish and Wildlife headquarters), and the Westborough Community Land Trust’s Hero Property. Some neighborhoods, such as the Hundreds Road area, have red squirrels. Like other New England towns, Westborough has its share of native squirrels – gray squirrels, including one short-lived white squirrel, red squirrels, and flying squirrels – but people who live or walk near stands of pine, spruce, or hemlock often claim that red squirrels are their favorite. What gives red squirrels (Tamiasciurus hudsonicus) such appeal? It might simply be that red squirrels are smaller and less common in Westborough than gray squirrels. Their rusty red color, most intense in September, is an added attraction. But the biggest reason may be their intelligence. They’re said to be smarter than other squirrels. Red squirrels’ claim to fame – and perhaps a sign of their intelligence – involves maple trees. Like hearty New Englanders, red squirrels are known for harvesting sap in late winter and turning it into a kind of maple syrup. Their maple sugaring technique is quite simple. 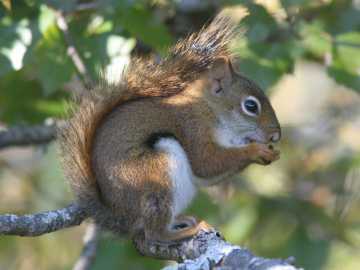 A red squirrel bites the trunks or branches of sugar maples or red maples, making V-shaped cuts with its large front teeth. But here’s the clever part. The squirrel then leaves while sap oozes from the cuts and water evaporates from the sap, and comes back later to lick the sugary “maple syrup” that remains. Folklore even credits red squirrels with the origin of maple syrup. The story goes that humans, particularly Native Americans, first learned to tap maple trees for sap by watching red squirrels. According to legend, an observant young Iroquois saw a red squirrel cutting tree bark and later licking the sap, and this youth decided to try the same thing. Maple sap gives red squirrels an energy snack in the spring, but right now they’re busy storing away food for the coming winter. They don’t hibernate, so they’ll need to eat. In winter they may protect themselves from weather and predators by tunneling under the snow to food. Red squirrels stockpile food in only a few places, instead of burying nuts all over the place as gray squirrels do. A red typically digs a burrow under a log or tree roots and fills it with nuts and pinecones that haven’t yet opened to drop their seeds. A red squirrel might store a bushel of food in one burrow. Or sometimes a squirrel might simply pile pinecones at the base of a tree or between fallen logs. With such large storehouses, it’s not surprising that red squirrels guard them vigorously in fall, winter, and spring (but not summer). A red squirrel chases other squirrels and animals away from its cache of food and may even sleep near the food in a nest in the burrow. It also keeps birds away. Why? Some birds may compete for seeds from pinecones or, in the case of blue jays, for acorns. These smart little squirrels are territorial, feisty, solitary, and rather unsociable. A red squirrel’s territory is small, only about an acre, but it may contain more than one storehouse. A red squirrel may also have more than one nest, located in a burrow or tree hole, or built of leaves high in a cone-bearing tree. During the fall, the young red squirrels born earlier this year are busy establishing their own territories and food storehouses. This is job one for them if they’re to survive the winter. Only about one in four reaches one year of age. Hawks, owls, foxes, coyotes, and fishers get many of them. If at first you don’t see red squirrels on a walk through pine woods, you can often hear them. Red squirrels chatter loudly at the approach of an intruder or predator, and other animals of the forest take notice and are warned. As you stroll along peaceably, a red squirrel is likely to scold, approach part way, and stamp its feet and flick its tail to let you know that you’re intruding on its territory. To find evidence of red squirrels, look for the cores or “skeletons” of pinecones that remain after the rest of the cone has been chewed off. It takes a red squirrel only 2 minutes to strip the cone of white pine and eat its 45 or so seeds. Keep an eye out for piles of discarded pinecone parts and nutshells, which make up a red squirrel’s garbage heap, or “midden.” You can often find one around an old stump or a nice flat rock, which serves as a dining table where the squirrel can eat and at the same time watch for trouble. The red squirrel’s food storehouse is probably nearby, and so too is a tree or burrow for quick escape if trouble arrives. Once you get the hang of it, these places are not hard to spot. Do red squirrels eat anything else besides seeds from cones, acorns, and maple sap? They actually eat a wide variety of foods, including bark, tree buds, and berries. If you see mushrooms in the woods and notice that the tops are gone from some of them, you may be looking at the work of squirrels, red or gray. Red squirrels collect mushrooms and set them out to dry on pine branches before storing them away for the winter. They can even eat mushrooms that are poisonous to humans, such as various kinds of Amanita mushrooms. Red squirrels don’t stick to a vegetarian diet. They’ll eat meat when they can get it – not only insects, but also birds’ eggs, baby birds, salamanders (which often hide in existing burrows) and frogs (which can be found in trees and bushes as well as on the ground), mice, and baby rabbits. Do red squirrels really drive out gray squirrels, as some people think? Normally there’s not a lot of conflict between red and gray squirrels because reds favor cone-bearing trees and grays favor hardwoods. But a year with a generous crop of hickory nuts – a real favorite – can create an exception. In such years, red squirrels sometimes leave their usual pine woods and move to hardwood areas full of hickory trees, and they may even chase away the gray squirrels that usually live there. In late February and early March, watch for red squirrel mating chases. A female red squirrel is receptive for breeding for only one day, but she will probably attract several males. Females typically mate with more than one male, possibly including male relatives, but then return to their solitary lifestyle. They bear about 4 young about a month later, usually in the safety of a nest in an old woodpecker hole. Newborn red squirrels are born pink and blind, but they quickly grow fur and are weaned in about 2 months. The mother may move her young to other nests she has built within her territory, and as they mature, she may take them to a nest at the edge of her territory to encourage them to leave. The young squirrels often come and go until they’ve established themselves elsewhere. Surprisingly, red squirrels can swim. But they need to watch out for snapping turtles and large fish.